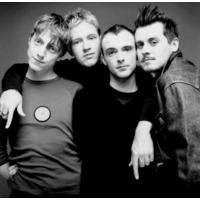 Travis are a post-Britpop band from Glasgow, Scotland, comprising Fran Healy (lead vocalist, guitar, piano, banjo), Dougie Payne (bass guitar, backing vocals), Andy Dunlop (lead guitar, banjo, keyboards, backing vocals) and Neil Primrose (drums, percussion). They named themselves after the Harry Dean Stanton character Travis Henderson from the film Paris, Texas. The band's debut album Good Feeling, released on September 8, 1997 entered the UK Album Charts at #9, spending 9 weeks inside the UK Top 100. Singles released from the album were not too successful, with the album's lead single "All I Want to Do Is Rock" charting at #39 on the UK Singles Charts. However, it wasn't until the release of their second studio album The Man Who that Travis began to develop a name for themselves in the music industry, with continued success into the 2000s. The Man Who charted at #1 on the UK Album Charts, and spent 104 weeks inside the UK Top 100. Their third studio album, The Invisible Band was released on June 11, 2001, and like The Man Who, The Invisible Band debuted at #1 on the UK Album Charts, where it remained for 4 weeks in total, and went onto spend a total of 54 weeks inside the UK Top 100 album charts. Although their fourth album, 12 Memories did not make the top spot in the United Kingdom, it debuted at #3, spending a further 11 weeks on the charts in the UK, and still got certified Platinum status by the BPI. Travis released a compilation album Singles in 2004, debuting at #4 on the UK Album Charts, released their fifth studio album The Boy With No Name in 2007, debuting at #4 on the UK Album Charts. and their sixth album was released in September 2008, entitled Ode To J. Smith, debuting at #20 on the UK Album Charts.